Is the Arab World Turning Its Back on the Palestinians? Current: Is the Arab World Turning Its Back on the Palestinians? American efforts to avoid vetoing a UN Security Council resolution on a Palestinian state, and earlier expressions of displeasure by the U.S. Administration over Israel’s settlements may be based on the assumption that the “Palestinian problem” was dear to every Muslim and Arab around the globe. It was and is believed by some that the way to win over Muslim sympathy and gratitude to the United States was through championing the Palestinian cause and statehood. In countries now suffering from the consequences of the “Arab Spring” (that became the “Arab Storm”) not only has the Palestinian problem completely lost the attention of the Arab peoples, but many Arabs and their governments display outright animosity toward the Palestinians. The first omen came from Iraq and Kuwait. The Iraqis expelled the Palestinians in 2006 because of their special relations with the hated tyrant, Saddam Hussein, and it is no coincidence that Iraq is no longer a partner to any pro-Palestinian initiative, including the current Palestinian statehood resolution. The pattern was set in 1991 when Kuwait expelled some 400,000 Palestinians in retaliation for the PLO’s support for Iraq’s brutal occupation of Kuwait in 1990. Traditionally, Egypt was always the standard bearer for the Palestinian cause, but today it perceives the Palestinians as a security threat because of Hamas’ deep involvement in terrorism in Egypt and Sinai. Palestinians report on their unpleasant experiences passing through Cairo airport and the tight siege imposed on Gaza at the Rafah crossing with Egypt. Palestinian individuals also report that it is risky for them to be recognized as Palestinian while walking in the streets of Cairo, and Tahrir Square is particularly dangerous. A similar phenomenon is reported in Syria, particularly in the sober response to the hated Assad regime’s Baathist call for the “liberation of Palestine.” The Syrians understood that the despotic Assad regime used the slogan to strengthen its control of Syria, explained Syrian opposition leader Dr. Kamal Lubwani in his publicized visit to Israel in September 2014. He was specific in his statements that the Palestinian problem is the concern of Palestinians with no linkage to the Syrian problem. Hundreds of Palestinians in Syria have been killed in the Syrian chaos over the past four years. 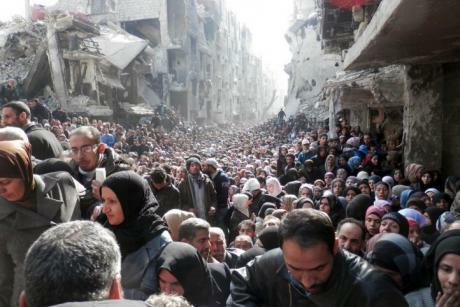 The Yarmouk camp on the outskirts of Damascus has been under brutal siege by Syrian government forces. Civilian buildings have been bombed from the air and shelled with heavy weapons, and widespread starvation has been reported. For more than a year, Palestinians seeking to escape the violence in Syria have found their entry to Lebanon and Jordan barred. Some already in Jordan were deported back to Syria. The latest “Gaza reconstruction” conference in Cairo was most telling: “What about us?” asked Syrians in their Facebook pages, arguing that no one cares that their country has been totally destroyed. The “what about us?” outcry also came from Palestinian refugees in Syria whose homes were destroyed several years ago. The special attention to the plight of the Palestinians in Gaza and the West Bank not only does not bring Arabs closer to the United States – it may even distance them further.